Buddy Joslin is an Australian Shepherd/German Shepherd mix and is about 9 years old. We brought Buddy home from the SPCA in July 2000 and he has been an official family member ever since. “He has a torn ligament in his right knee. If we did not have the $3,000.00 surgery (plus recovery time), the injury would saw the remaining good ligament and cause him to put pressure on his other leg which would result in the same injury and create back problems as well”. It only took one month for all of this to take effect. December was a miserable month for Buddy. He went from being an active outside dog who loved to play to an inside dog with little activity. We had to make sure nobody threw his favorite football, so he wouldn’t try to chase it, because he would regret it right away. He could no longer jump up on the bed or couch. We tried to make him as comfortable as possible. I heard that my co-worker, Kim Mercer, was really good with animals and that several people had been going to her for treatment and vitamins. So I started telling her about my Buddy. At first she recommended a powder (Free & Easy) a Dynamite product which included glucosamine and a host of all other joint support ingredients, vitamins (Showdown) and giving him buffered aspirin. The vet prescribed Rimadyl, but after researching that product on-line, we thought that it would cause more internal damage than good. She also mentioned that she had an Electro-Acuscope that she thought would be a good treatment protocol for Buddy. On 1/4/07, Kim started her treatments twice a week. I was very hopeful and skeptical at the same time. I had never heard of an Acuscope and didn’t quite understand how it could heal him if we didn’t have the surgery. Unfortunately, Buddy just seemed to continue to get worse. He was having a really hard time getting up. He couldn’t stand up long enough to even finish eating his food. There was a time that he would always be by my side and follow me into each room around the house and now he just stayed in one place. It was very difficult to see him be in so much pain. 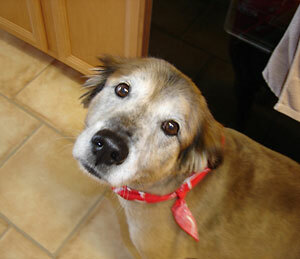 In February 2007, it finally got to the point where I made arrangements to have Buddy put down. My husband and I agreed to let Kim look at him one more time and tell us what we should do. After looking into his eyes, petting him and doing another Acuscope treatment, she suggested giving him one more week. She said that he just didn’t seem ready to go yet. Kim kept telling us to be patient and that it would take time. Well it was sure worth the wait because by May 1, 2007 Buddy was doing so well that Kim cut the Acuscope treatments from twice a week to once a week. Then on May 22, 2007, we were so impressed by the results that Acuscope treatments were now going to be only twice a month!!!!!! And now at the beginning of July he is doing well enough to just get a check up each month. Within 4 months, Buddy can now chase his football again. He feels so good that he can jump on the couch and bed too! He is still a little stiff when he gets up from a lying or sitting down position. But once he up he’s good to go. After he had his summer haircut we could tell that he lost some weight too. He looked like a brand new dog. You could tell he felt so much better. In retrospect, it is absolutely unbelievable the progress he was able to make considering how severe his injuries were. I just couldn’t fathom how the Acuscope treatments, mineral powder and vitamins could fix something that supposedly only surgeries could fix. Kim is not only full of knowledge but a miracle worker as well. We will be forever grateful for all that she has done for our family. After successfully completing my Electro Acuscope training with Joyce Jackson, from Animal Therapy Systems in June of 2004, I was looking for a test case and a challenge and I pretty much got what I asked for when presented with the following case. Sergei is a 9 yr old, 17 hand, purebred Akhal Teke gelding that in 2002 sustained a rear leg tendon sheath injury during a routine training ride. The initial injury was damage to the Lateral Collateral Ligament on the left hind in September, 2002. 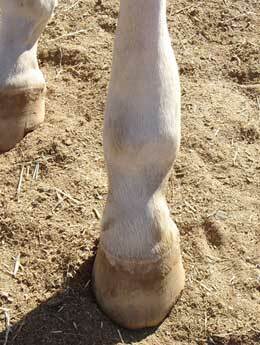 The injury was healing well, but adhesions had developed between the tendon sheath and tendon. When the adhesions tore free it caused significant discomfort. 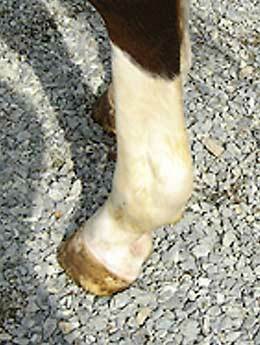 The concern was that as more adhesions tore, damage to the tendon might cause irreparable damage to the tendon. In March, 2003 a decision was made to perform arthroscopy surgery to remove the adhesions. After a lengthy stall rest, and hand walking he was progressing really well. The owner was hand walking him one morning and he reared, pulled the lead rope of the owners hand and galloped around the pasture for quite some time. Due to the galloping, the insertion points for the arthroscopic surgery opened and filled with fluid which caused swelling in the tendon sheath. The resulting fluid and swelling caused scar tissue to develop in the tendon sheath. At this point, the vet told the owners that he would be a pasture ornament and could not be ridden again, especially by the owner who at 6’3 is a big man. By the time I started therapy in August 2004, Sergei had been out to pasture for about 2 ½ years. I diligently started a treatment protocol on Sergei using Acuscope therapy and Dynamite Wound Balm sweats twice a week to address the scar tissue. I initially treated him very aggressively, up to three times a day for the first two weeks. We kept Sergei in a smaller paddock so he could move around freely, but not big enough to get silly. I continued treatment once a week after his initial introduction to Acuscope Therapy. After a couple of months, his readings were indicating another round of daily therapy were needed, he came back to my barn and I was able to treat him once a day for 10 days I really began to see significant improvement. This second round seemed to work well, at this point, his swelling was significantly down and I was able to put him back on a weekly schedule. The weekly schedule continued until May 2005, I checked him every two weeks after that, then every three weeks, and now I pop over there about once a month just to check how he is doing. 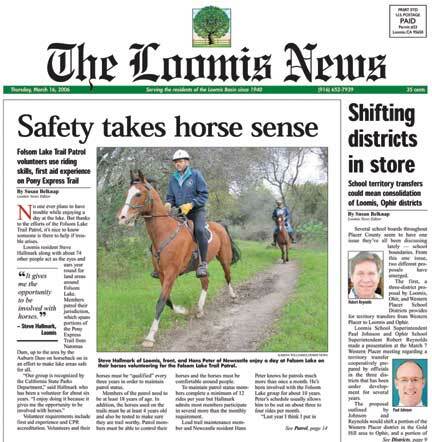 I have to say, he has gone beyond what anyone had ever expected, he was put back to work slowly in the Spring of 2005 and is now back at work and on the trail. After the same vet who declared him “a pasture ornament” who wouldn’t be ridden again, gave him a thorough evaluation in March 2006, he said “wow, go ride that horse”. Needless to say, I was thrilled with his progress as were the owners. Below is a testimonial from them as to their experience with this modality. “ Sergei is a 9 yr old purebred Akhal Teke gelding that in 2002 sustained a rear leg tendon sheath injury during a routine training ride. The injury required extensive rehabilitation, surgery and almost a year of stall confinement and hand walking only. Sergei was near the end of his rehab, when he let my husband know that he had had about enough of the year's worth of confinement by rearing up a breaking free from him as he was being hand walked in our pasture. Sergei bolted around our pasture like he was qualifying for the Indy 500. Needless to say, this episode resulted in a complete reversal of all of the benefit the surgery, year long rehab of the soft tissue, repetitive ultrasounds, etc. had done - and more injury to boot! At this point, all vets consulted basically gave us no hope that Sergei could recover to be considered sound & rideable again. The fear was there was now so much tissue damage and scar tissue that the tendon could never work properly. We were told to consider him a pasture ornament only. And to look at the leg, you could see why the vets were saying that. Kim Mercer, who I know from work, mentions that she had recently completed training course on her new acuscope machine. Once Kim explained to us just exactly what the machine does my husband & I look at her jokingly and say, "boy, do we every have a project horse for you". Kim explained that she thought she could help Sergei. My husband and I thought she was out of her mind. Even Kim was a little taken aback when she initially saw Sergei's leg. By this time, he had been a very unhappy pasture ornament for about 2 1/2 yrs. Kim diligently started a protocol on Sergei that combined the use of the Acuscope machine with Dynamite Wound balm sweats. For several months, we would watch as Kim worked on Sergei. Kim had faith in the protocol - always reminding us to be patient, that she knew she was helping Sergei's body to heal itself. We on the other hand, were convinced by now that she had lost her mind. But in the end, a year later, we are riding Sergei, a sound horse - as proclaimed by the same vet that thought he would never be sound again. The very happy ending to this story is that Sergei is by nature a horse that HAS to work. He is bold and fearless and loves going out and exploring the trails. He is always ready to go and to have lived the rest of his life as a pasture ornament would have been awful for him. I received a frantic phone call from Ruby's owner Kay (she was a regular therapy client of mine at that time), who told me that her husband had come home from running errands to find Ruby lying in the pasture on her side unconscious with blood coming out of her ears and nostrils. He called their regular equine veterinarian, and by the time Kay got home the veterinarian was there attending to Ruby. Ruby had regained consciousness by the time they arrived. Unfortunately, though, she presented with very traumatic neurological symptoms including extensive paralysis on her entire left side. She could not stand or move, and her head was traumatized. Her left ear was drooping down to her neck, her left eye was cloudy, her upper lip was twisted to the right, and her lower lip (on the left side) had a significant droop. She could not close her mouth at all. After the veterinarian performed his full extensive examination, his diagnosis was that Ruby had received a tramatic head injury that had resulted in her also having a stroke. He recommended euthanasia immediately as he felt her prognosis was not good. At that time Kay asked him about having therapy work done on her, and his response was: " I really don't think it will do any good, but if you are willing to try it certainly won't hurt anything at this point. Just be smart and humane about it and if she doesn't show significant improvement in a reasonable amount of time, please don't prolong the inevitable". When Kay called me and explained the situation, I told her to bring her over right away and we would be ready for her. Since Ruby was paralyzed on her left side, she could not walk or stand, so Kay and her whole ranch crew picked her up and carried her into the horse trailer. When they arrived at my rehabilitation center, they also had to carry her out of the horse trailer and lay her down in the stall. The veterinarian had followed them to my rehab center, and he then administered some IV fluids to keep her from dehydrating. We received his permission to start giving her a liquid probiotic (DynaPro) at that time, to help with her gut flora. He also said that it would be good if we could try to get some other nourishment (food) into her as soon as possible. He told us that was really all that he could do at that point to help and wished us good luck. The first thing we did was try and feed her a little mash made of Dynamite Complete Grain Ration (pelleted corn, oats and barley combined with some other nutrients), and bless her heart, she tried as best she could to eat. We had to sit on the floor with her and hand feed it to her - it's a little tough to chew when half of your mouth is paralyzed and your lower lip is drooping. It was a time consuming effort as whenever we would get some into her mouth and she would start chewing, half of it would fall down into her lower lip and fall out of her mouth. Somehow we got it done though. We started microcurrent therapy work on her immediately with the Electro-Acuscope and Myopulse. The Acuscope works primarily through the central nervous system and helps the body to activate (or reactivate) neuropathways that have been damaged. This allows the body to start the nerve-regeneration process which was very important in this case. The Myopulse addresses the electro magnetic field generated by soft tissue, so therefore gives direct access (stimulation) to connective tissue. At first, we primarily addressed treatment to her hoof capsules and frogs to stimulate the blood supply, which was very important in this case since she could not stand and had no frog pressure whatsoever to help with that issue. We also used the Acuscope on her poll and her spinal column to help activate the neuropathways and nerve roots along the brainstem and the spinal cord. Concentrated stimulation was applied down the entire length of the radial nerve and the ischiatic (sciatic) nerve. Our main goal to begin with was to get her to stand and walk around. The Myopulse was used to address the atrophy of the muscle tissue that was already starting to occur due to the paralysis. Nutritionally, we supplemented her with natural products (made by Dynamite Specialty Products, Young Living Essential Oils and Developmental Natural Resources). We chose specific products from each product line that would help decrease inflammation and help increase blood supply, stimulate nerve regeneration and promote healing. After a few days, we started to see some improvement in nerve function and a decrease in paralysis, and 5 days into this program, she stood several times per day/night and wobbled around. After 10 consecutive days of Electro-Acuscope and Myopulse Therapy, massage and nutritional supplementation, she stood and moved almost like a normal horse, and at the two week point, there was virtually no trace of the body paralysis. We were now left with the head and facial paralysis issues. We started applying concentrated Electro-Acuscope and Myopulse treatments to these areas. All of the auricular nerves were addressed, as well as the facial nerves running down to the upper and lower lips. All of the nerves around the eye itself were also stimulated. The major muscles and connective tissue in the head area were treated with the Myopulse specifically. After 7 consecutive days of concentrated work on the head, the ear started to stand up on its’ own and the cloudiness started to clear from the eye. Her upper and lower lips started to move back into their normal positions. Exactly one month after she came to my rehabilitation facility, her readings were up to normal (and stabilized) on the Electro-Acuscope, and the only symptom that she still exhibited was a minor drooping of her lower lip. She had complete control of the lower lip when she was concentrating, but at rest it still drooped slightly. At that time, we felt that Ruby could be released to go home with Kay. Since these microcurrent instruments do not do the healing but allow the self-healing mechanisms in the body to be activated, we felt that all she needed was a little more time for the body to catch up and complete the healing process. 30 days later, Kay brought Ruby back for a recheck, and all of her symptoms were completely gone she had regained full use of her lower lip and had complete control of its functions, i.e., opening/closing, chewing, etc. Her readings were still stable, and there were no traces of her traumatic accident. She was re-examined by her regular veterinarian not long after, who released her with a clean bill of health. **Footnote: Since her injury and rehabilitation, Ruby has since gone on to win many awards at the Arabian Nationals and World in Halter, English and Western classes. To this day, she has shown no traces or residual of her life threatening traumatic injuries. Animal Therapy Systems Company Policy dictates that instruments* are only sold to someone (any individual, company or entity) who has enrolled in, paid tuition for, attended and completed the ATS Approved Animal Acuscope Basic Training and Certification Program. NO EXCEPTIONS. *This includes any and all models of Acuscope, Myopulse, Myoscope and Neuroscope. Copyright © Joyce Jackson 2002 – Present. All rights reserved. expressed written permission of Animal Therapy Systems.